In a recent news, the Edo State Government have uncovered a secondary school where human traffickers harvest teenagers. The Senior Special Assistant to Governor Godwin Obaseki on Anti Human Trafficking Issues, Comrade Solomon Okoduwa, who made the startling revelation on Sunday in Benin during the ongoing advocacy programme on Human Trafficking and Illegal Migration, said that over 100 students of Idogbo Secondary School have been trafficked to Libya in the last four months. Mr Okoduwa said the fact was revealed by some teachers in the school. Comrade Okoduwa, who lamented the situation said government will not fold its arm to allow the evil to continue to thrive in the state. He said there will be increased awareness while the state Task Force Against Human Trafficking will be on the trail of the suspected human traffickers. Okoduwa thereafter admonished the students to be wary of the antics of the traffickers who are bent on deceiving them into the journey. He continued: “Henceforth, report anyone who tells you to travel to Europe. They are simply taking you through Sahara Desert and the Mediterranean Sea and you may eventually end up in Libya. “Many died of hunger, many were drowned in the Mediterranean sea in search of greener pastures. Worst still, the families of those people that died on their journey were still made to pay for the travel expenses unknown to them that their loved ones have gone to the great beyond. If anyone tells you to travel abroad through Libya, tell him or her capital ‘NO’. If you must travel for any reason, travel the right way. Okoduwa however informed the students to shun any act capable of destroying their future. “It is better you concentrate on the benefits of getting engaged back at home. Anyone who mean well for you will not truncate your academic process. In the past six months, Edo State Government has received about 3,400 returnees who are origins of the state. They’re all starting from square one, if they were pre-informed, they won’t have undergone the fruitless journey. “The ills of illegal migration and human trafficking must be widely publicized and concerted efforts must be taken by all relevant agencies to end the scourge, Okoduwa asserted. 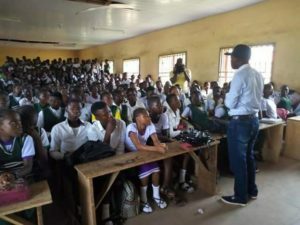 The principal, Idogbo Secondary School, Mr Usifo Enaruwa Moses was full of appreciation to the state government and promised to continue to re-echo the message of anti human trafficking and irregular migration to the students in assembly ground every day. Comrade Solomon Okoduwa and his team also visited Useh Secondary school, at Ogida, Egor Local Government Area of Edo State, for a similar anti human trafficking campaign.